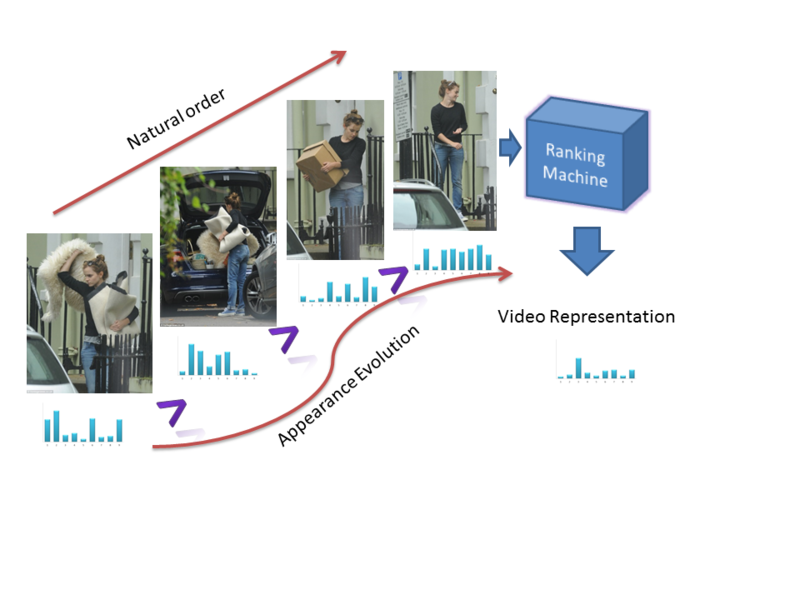 Rank pooling for video analysis and human action recognition. Modelling the evolution of appearance. We propose a function-based temporal pooling method that captures the latent structure of the video sequence data - e.g. how frame-level features evolve over time in a video. We show how the parameters of a function that has been fit to the video data can serve as a robust new video representation. As a specific example, we learn a pooling function via ranking machines. By learning to rank the frame-level features of a video in chronological order, we obtain a new representation that captures the video-wide temporal dynamics of a video, suitable for action recognition. Other than ranking functions, we explore different parametric models that could also explain the temporal changes in videos. The proposed functional pooling methods, and rank pooling in particular, is easy to interpret and implement, fast to compute and effective in recognizing a wide variety of actions. We evaluate our method on various benchmarks for generic action, fine-grained action and gesture recognition. Results show that rank pooling brings an absolute improvement of 7-10 average pooling baseline. At the same time, rank pooling is compatible with and complementary to several appearance and local motion based methods and features, such as improved trajectories and deep learning features. 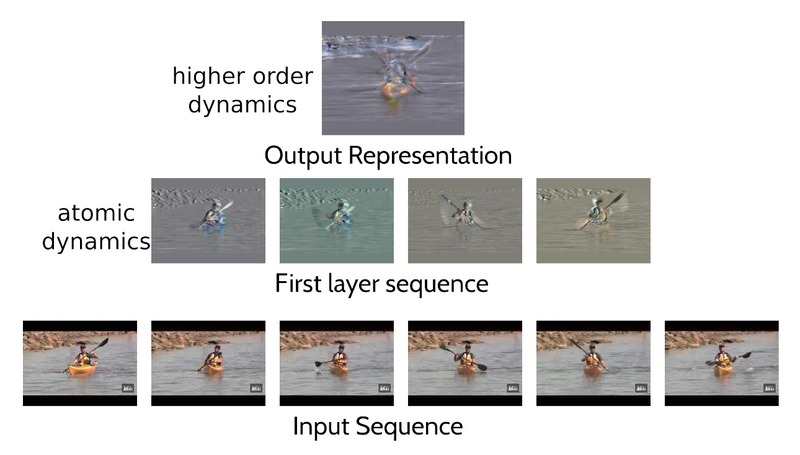 We introduce the concept of dynamic image, a novel compact representation of videos useful for video analysis especially when convolutional neural networks (CNNs) are used. The dynamic image is based on the rank pooling concept and is obtained through the parameters of a ranking machine that encodes the temporal evolution of the frames of the video. Dynamic images are obtained by directly applying rank pooling on the raw image pixels of a video producing a single RGB image per video. This idea is simple but powerful as it enables the use of existing CNN models directly on video data with fine-tuning. We present an efficient and effective approximate rank pooling operator, speeding it up orders of magnitude compared to rank pooling. Our new approximate rank pooling CNN layer allows us to generalize dynamic images to dynamic feature maps and we demonstrate the power of our new representations on standard benchmarks in action recognition achieving state-of-the-art performance. We introduce a new model for representation learning and classification of video sequences. Our model is based on a convolutional neural network coupled with a novel temporal pooling layer. The temporal pooling layer relies on an inner-optimization problem to efficiently encode temporal semantics over arbitrarily long video clips into a fixed-length vector representation. Importantly, the representation and classification parameters of our model can be estimated jointly in an end-to-end manner by formulating learning as a bilevel optimization problem. Furthermore, the model can make use of any existing convolutional neural network architecture (e.g., AlexNet or VGG) without modification or introduction of additional parameters. We demonstrate our approach on action and activity recognition tasks. We present hierarchical rank pooling, a video sequence encoding method for activity recognition. 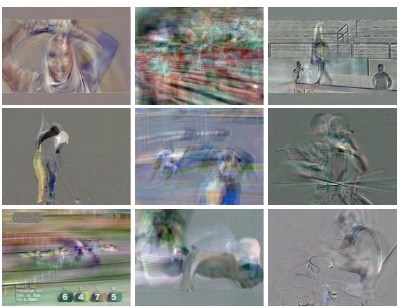 It consists of a network of rank pooling functions which captures the dynamics of rich convolutional neural network features within a video sequence. By stacking non-linear feature functions and rank pooling over one another, we obtain a high capacity dynamic encoding mechanism, which is used for action recognition. We present a method for jointly learning the video representation and activity classifier parameters. Our method obtains state-of-the art results on three important activity recognition benchmarks: 76.7% on Hollywood2, 66.9% on HMDB51 and, 91.4% on UCF101.